Our range of products include cpvc pipe, industrial cpvc pipe, cpvc water pipe, cpvc plumbing pipe, ashirvad cpvc pipe and cpvc pipe finolex. 20 mm dia to 50mm, SDR 11 & SDR 13.5. 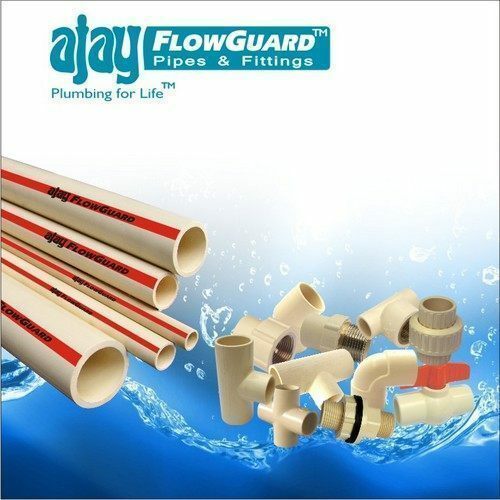 We are leading traders and suppliers of Ajay CPVC Pipes and Fittings. 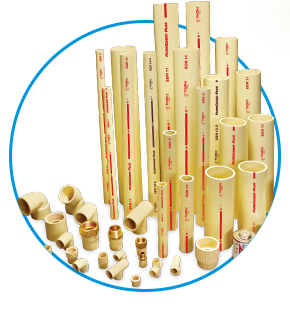 These are sourced by us from ‘Ajay’ a leading name in the field of CPVC Pipes & Fittings. 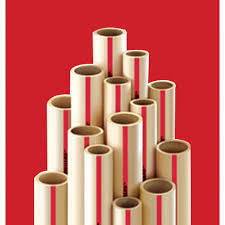 These are manufactured using specialty plastic known chemically as chlorinated polyvinyl chloride (CPVC) as well as use of new technology that makes these deliver increased performance, durability and toughness in given applications. Further, these piping solutions are also perfect for potable hot and cold water distribution and can be easily assembled using commonly used tools. 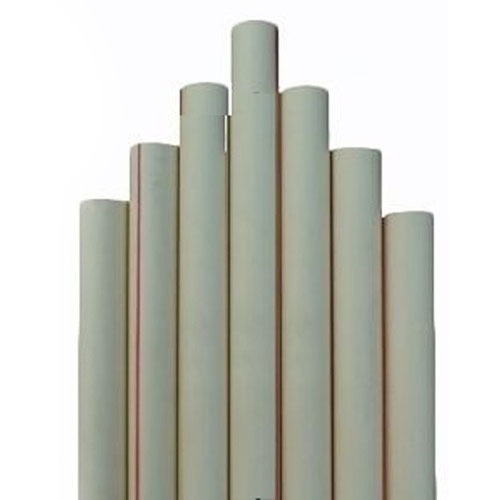 Meeting all requirements of ASTM D 2846, these are produced in copper tube size ½”, ¾”, 1”, 1 ¼” , 1 ½” & 2” SDR 11 and SDR 13.5 as well as also manufactured as per BIS specifications IS 15778:2007. Astral Poly Technik Ltd is very proud to introduce CHLORINATED POLY VINYL CHLORIDE [CPVC] for the first time into this part of the globe, under license from Lubrizol, [formerly Noveon, USA], which is now known as Astral CPVC pro. It is also manufacturing Industrial Piping System under brand name Astral. Astral cpvc pro are made from the specialty plastic, chemically known as Temperature Chlorinated Poly Vinyl Chloride [CPVC]. This CPVC compound shall meet cell class 23447 B as defined by ASTM D1784 and have a design stress of 2000 PSI and a maximum service temperature upto 93??C.? ?Pipes are produced in copper tube size (CTS) from 15 mm (?????) to 50 mm (2???) with two different standard dimensional ratios - SDR-11 and SDR-13.5. 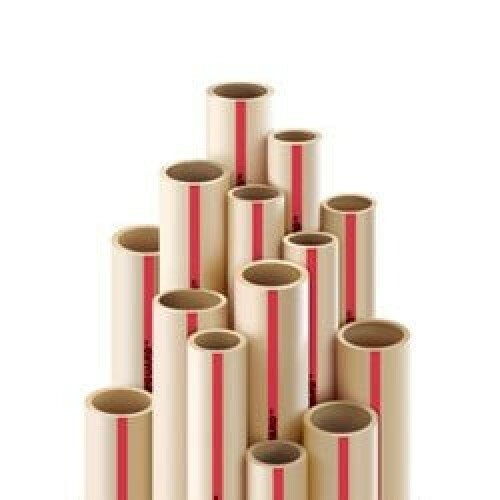 The fittings are produced as per SDR 11. 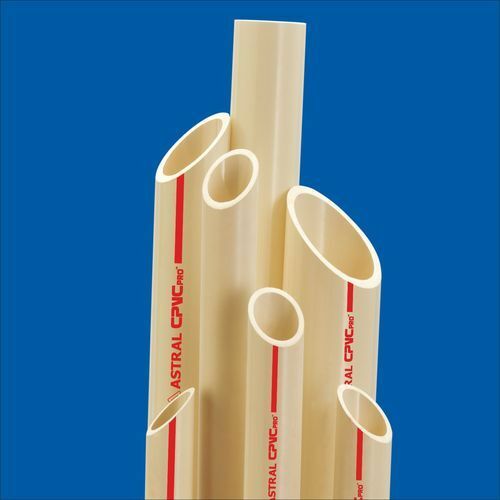 All Astral CPVC SDR 11 and SDR 13.5 pipes are made from identical CPVC compound material having same physical properties. The CPVC fittings are manufactured from compound material which meets all the requirement as per ASTM standard. 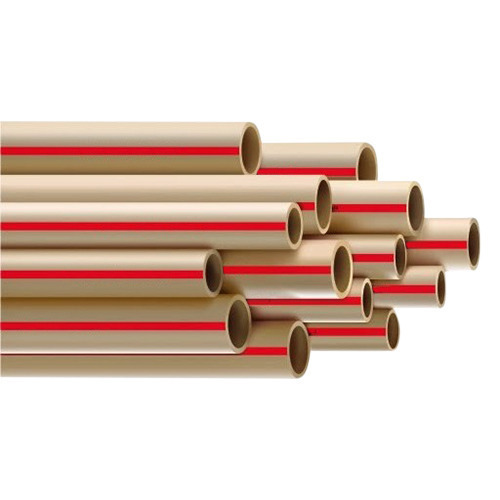 CPVC pipes of Copper Tube Size (CTS) dimensions can also be applied to CPVC (IPS) dimensions by using IPS x CTS fittings. The CPVC pipes from 15 mm (?????) to 50 mm (2???) are also produced as per IS 15778 standard in both class that is Class 1 (SDR 11) and Class 2 (SDR 13.5).? ?Apart from having the same physical properties, SDR 11 and SDR 13.5 which are having different wall thickness and therefore, at any given temperature, they have different pressure ratings. Astral Poly Technik Ltd is very proud to introduce CHLORINATED POLY VINYL CHLORIDE [CPVC] for the first time into this part of the globe, under license from Lubrizol, [formerly Noveon, USA], which is now known as Astral CPVC pro. It is also manufacturing Industrial Piping System under brand name Astral. Astral cpvc pro are made from the specialty plastic, chemically known as Temperature Chlorinated Poly Vinyl Chloride [CPVC]. 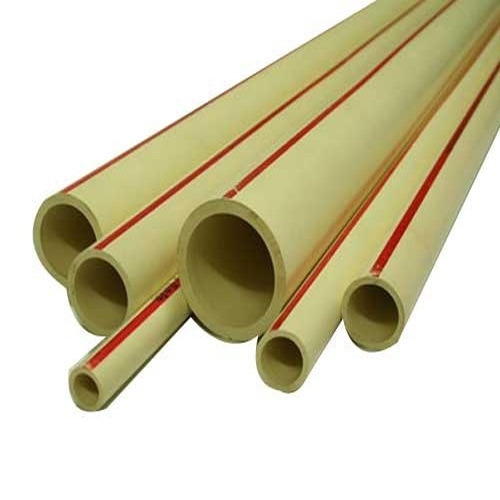 This CPVC compound shall meet cell class 23447 B as defined by ASTM D1784 and have a design stress of 2000 PSI and a maximum service temperature upto 93C Pipes are produced in copper tube size (CTS) from 15 mm to 50 mm (2with two different standard dimensional ratios - SDR-11 and SDR-13.5. The fittings are produced as per SDR 11. 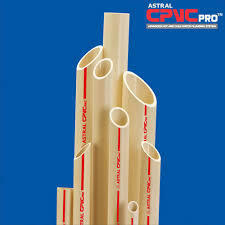 All Astral CPVC SDR 11 and SDR 13.5 pipes are made from identical CPVC compound material having same physical properties. The CPVC fittings are manufactured from compound material which meets all the requirement as per ASTM standard. 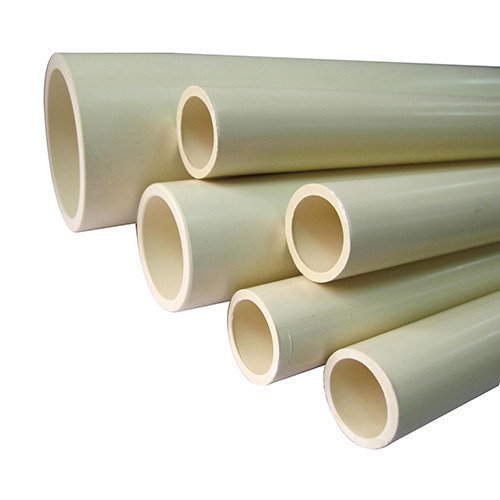 CPVC pipes of Copper Tube Size (CTS) dimensions can also be applied to CPVC (IPS) dimensions by using IPS x CTS fittings. The CPVC pipes from 15 mm to 50 mm (2 are also produced as per IS 15778 standard in both class that is Class 1 (SDR 11) and Class 2 (SDR 13.5 Apart from having the same physical properties, SDR 11 and SDR 13.5 which are having different wall thickness and therefore, at any given temperature, they have different pressure ratings. Astral Poly Technik Ltd is very proud to introduce CHLORINATED POLY VINYL CHLORIDE [CPVC] for the first time into this part of the globe, under license from Lubrizol, [formerly Noveon, USA], which is now known as Astral CPVC pro. It is also manufacturing Industrial Piping System under brand name Astral. Astral cpvc pro are made from the specialty plastic, chemically known as Temperature Chlorinated Poly Vinyl Chloride [CPVC]. This CPVC compound shall meet cell class 23447 B as defined by ASTM D1784 and have a design stress of 2000 PSI and a maximum service temperature upto 93??C.? Above 65mm upto 150mm. Astral Poly Technik Ltd is very proud to introduce CHLORINATED POLY VINYL CHLORIDE [CPVC] for the first time into this part of the globe, under license from Lubrizol, [formerly Noveon, USA], which is now known as Astral CPVC pro. It is also manufacturing Industrial Piping System under brand name Astral. Astral cpvc pro are made from the specialty plastic, chemically known as Temperature Chlorinated Poly Vinyl Chloride [CPVC]. This CPVC compound shall meet cell class 23447 B as defined by ASTM D1784 and have a design stress of 2000 PSI and a maximum service temperature upto 93??C.? Above 65 mm to 150 mm.